Now this we can get behind! Earlier in the year, we featured several Adidas and Dragon Ball collab pairs that have taken the anime and shoe scene by storm. While they didn’t look as good as we hoped they’d be, we kept our hopes up that those were just concept or prototypes that could be improved upon. Lo and behold, a first “real” look at a possible production pair comes out in the form of the Prophere “Cell” silhouette, check it out below! 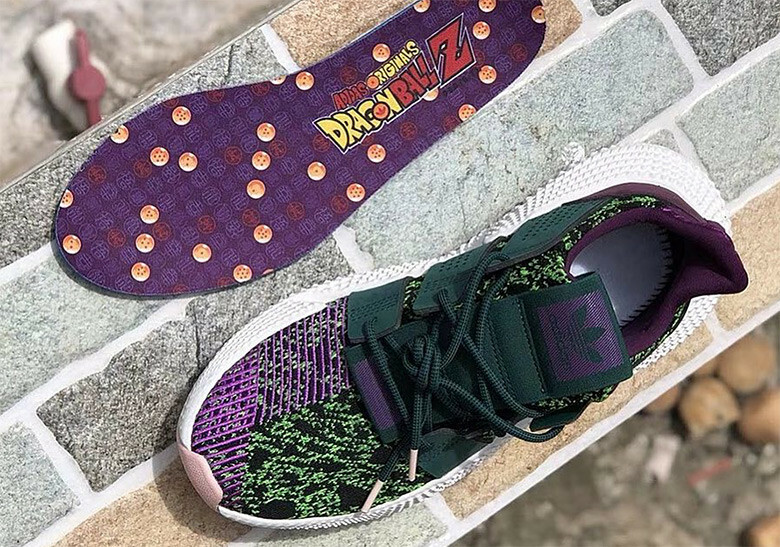 The Prophere model was used as a base for this design, with a color combination of purple and green all throughout the upper as expected. One fine detail of the shoe is the insole of the pair, sporting the classic Dragon Ball Z logo as well as the Dragon Balls scattered around. The box is nothing to scoff at as well, showing sketches and graphics around the side panels, and if this is any indication, then the whole collection looks to be one that fans of the anime and shoe collectors would want to look out for when it releases! No news yet of the release date as of this writing so stay tuned for more info on this hot release!